Opened in 1988, Kuching Civic Centre is one of the most favorite buildings in Kuching. The umbrella shaped tower offers a spectacular view of the city. The viewing platform served by two bubble lifts, can be accessed only during daytime. 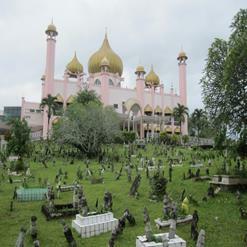 It has a planetarium known as Planetarium Sultan Iskandar which is worth a visit. Kuching Civic Centre also has a hall which can be used for events and celebrations.